Also see the newer Auld Hoose at number 429 Gallowgate. 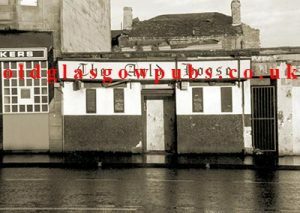 This is the original Auld Hoose on the Gallowgate which was demolished in 1991. New flats now occupy the site of this once popular east end local. 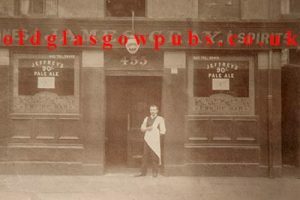 It was once called The Empire Bar run by James Gray from 1906 to 1922, he left this old pub and took over larger premises at 14 Kelvinhaugh Street, west end. James Gray standing proudly outside his Empire Bar 1920. To read more on the history of this old pub click here. 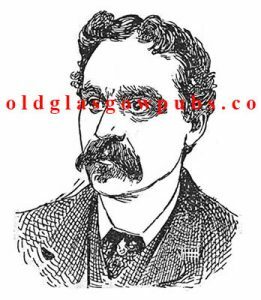 One of the proprietors of the this pub was Patrick O’Brien an Irishman from Co. Monaham. see Owen’s Bar, Coatbridge.